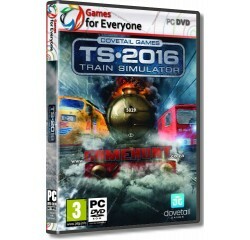 Train Simulator 2016 - R120,00 : Game Hunt, Where we lead, others follow. Ever dreamed of driving trains? Now you can! Train Simulator 2016 brings to life some amazing extreme train challenges on real world routes and delivers the ultimate railway hobby. Precision: Beat the clock as a Deutsche Bahn driver on the challenging West Rhine Main Line. Plus, with Train Simulator 2016, get started on your driver career at the TS Academy and master your machines with support from the new Driver Assists system - you can also capture the perfect scene in the all new Railfan mode. Learn to drive different trains at the TS Academy and qualify as a train driver. Master your Machines with support from the new Driver Assists system. Capture the perfect scenes in the all new Railfan mode. Three fantastic real-world routes including Sherman Hill (USA), Riviera Line: Exeter to Kingswear. Quick Drive menu system: drive what you like, where you like. Drive with Xbox 360 controller, keyboard or mouse. Integrated Steam Workshop free mission download centre. Create your own routes with powerful in-game editing tools. Access the Train Simulator community in-game. Processor - 2.8 GHz Core 2 Duo® or equivalent AMD® processor. Memory - 2 GB RAM (Windows 7 - 64bit).